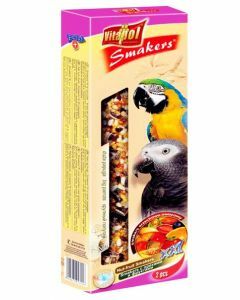 The bird treats online available at Pets World gives supplemental nutrition to your bird. Want to see your bird chirping around happily and energetically? Then make sure to check out the huge array of bird treats on the site to keep it active and lively. 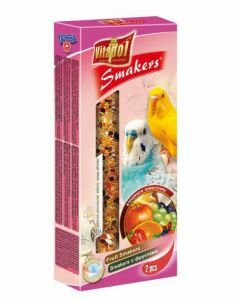 Vitapol Fruit Smakers For Budgies can be hung in the cage that will engage the pecking instinct of certain bird species as well as give nourishment. Their ingredients can be coconut, berries, fruits, nuts, dehydrated apple, etc., are easily digestible and thus helps to maintain the beauty of the bird. 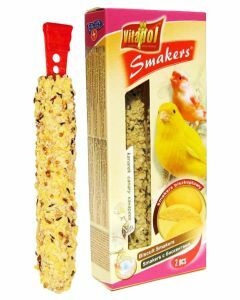 At Pets World, bird treat for training will help you with developing the learning instincts of your prized pet birds. Birds are known for their quick learning abilities and are trained to speak, to climb, and do various tasks. 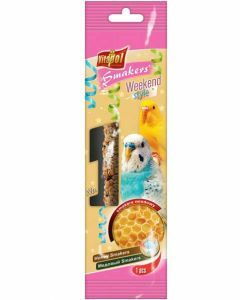 Our bird treat for training can aptly aid in your process to teach your pet bird. Our products from Kiki, Vitapol, etc. 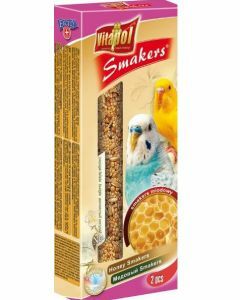 can be used for different birds like parrots, budgies, budgerigar, parakeets, etc. You can choose from a variety of options depending on your bird’s liking. All products are 100% vegetarian, safe for bird consumption, healthy, and made from the best ingredients so as to not cause any harm to your beloved pet.